In a gleaming white heritage building in the main street of the town of Canowindra, NSW is the world-famous Canowindra Motors Holden Museum. Enter this building and you will surprised to see a huge collection of immaculate vehicles in the old service area down behind the dealership showroom. 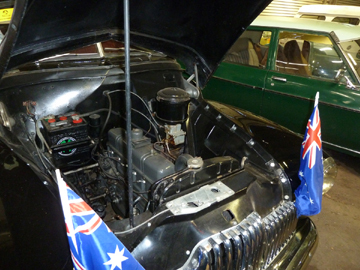 Charlie McCarron with his HX Holden in Canowindra Motors Holden Museum. The gem of the collection is an FX Holden. 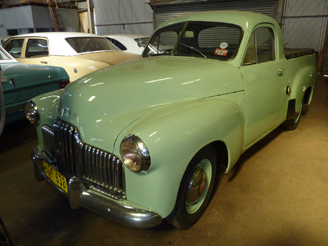 This was the 46th car produced on the very first assembly line of Holden cars manufactured in Australia. The year of manufacture was 1948. Holden, manufactured by General Motors of the United States in various states of Australia, is often called "Australia's own car". It was Holden that put cars on the road in Australia in the same way that it was Ford that put cars on the road in America and Austin that did that in the United Kingdom. And this FX Holden (original model name 48/215) in this Canowindra museum is no doubt the most famous Holden in the world. 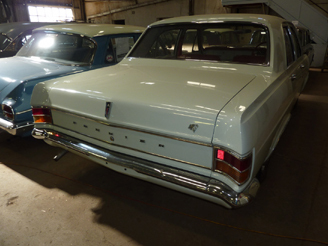 It is one of only six FX Holdens of the original 163 manufactured that have survived. And it is one of only two FX Holdens that are still registered and permitted to be driven on Australian roads. This FX Holden is in close to its original condition and with almost all its original parts  the only things that have been replaced are the original coat of paint (it has been repainted with the same kind of black auto paint) and the tires, and a carpet has been added to the floor. And unlike the other registered FX, this one has only 22,000 miles (about 35,000 km) on the clock. It weighs about one ton, has six cylinders and develops 60 horsepower. It is not a really big car, being built on a 103 inch (269cm) wheel base but it still seats six people and has quite a big boot (trunk). 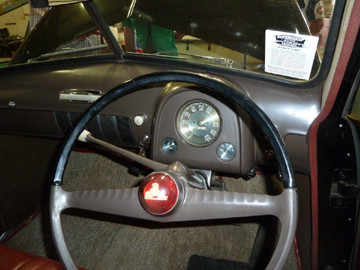 It has some optional extras that date from 1948 including leather seating and a second interior sun visor, as well as an ash tray and cup holders. 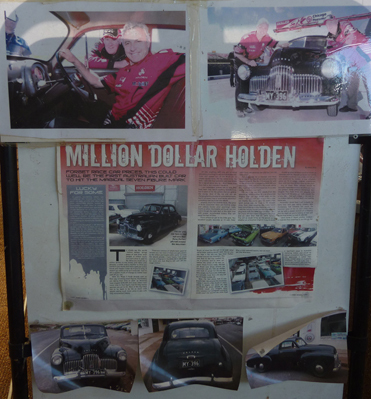 The owner and founder of this Museum is Charlie McCarron who has been a Holden dealer for over 55 years. During a trip to the United States in 1954 (he was there as a International Farm Youth Exchange student), he visited The Henry Ford Museum where they had the first and last T-Model Fords on display in glass cases. 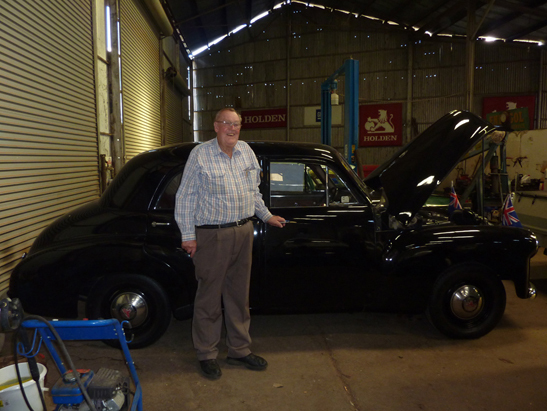 This inspired him with an interest in old classic cars and, when he became a General Motors Holden dealer in 1959, to try to find one of the first model of Australia's own car -- the 1948 HX Holden -- for his personal collection. 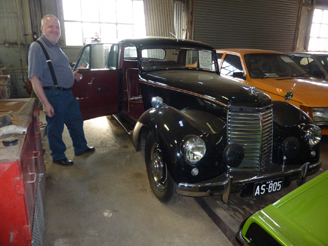 He operated his Holden dealership in Canowindra and patiently assembled a collection of 50 classic and collectable cars with a special emphasis on Holdens. You could say that he was not just interested in selling Holdens but was also interested in collecting them too! 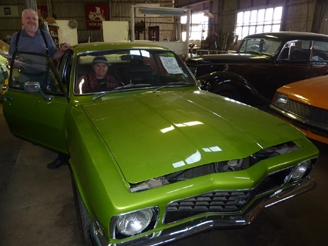 Mr McCarron was finally able, after a long search, to purchase the FX Holden in 1970. He bought it from a seller in Tanunda, South Australia and drove it all the way back to Canowindra. On 6 October 2004 the celebrated Australian motor racing driver Peter Brock (nicknamed "Brocky" by his fellow Australians) drove this very FX on a lap as a parade car at the Mount Panorama (Australia's most famous race track) at Bathurst, NSW. Articles and photos of Peter Brock and Charlie McCarron's FX Holden at Bathurst. Peter Brock told Charlie McCarron that he never thought that he would drive a new FX (although he had driven and smashed up about 20 of them in his younger days). 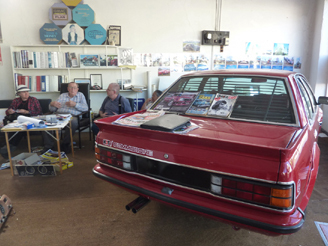 There are a number of photos of "Brocky" and Charlie in the Canowindra Motors Holden Museum. Sadly, this was to be the last car that Peter Brock (who was often dubbed the King of the Mountain due to his nine victories at the Mount Panorama race track) was to drive at Bathurst as he was to die in a rally in Western Australia in 2006. The same FX also led the V8s around the Mount Panorama race track in 2008. Some of the cars in the collection. The FX Holden is the black car on the lefthand side at the back. 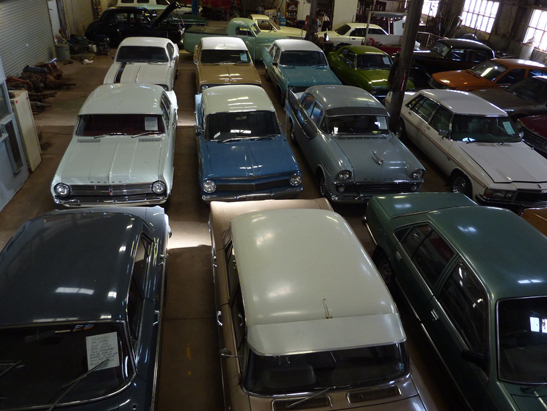 In the second row (from front) are an HD Holden (white), a 1963-64 EH Holden (white and blue) and a 1961 EK Holden. In the third row is a Holden Monaro GTS (white with black stripe). Charlie McCarron used to have nearly every model of the Holden from the HX up to the VN. Holden LJ Torana GTR XU-1, built in 1972. This lime green model with two doors is an ex-Bathurst racing model. A 1950 Armstrong Siddeley Whitley with its original paint and trim and just 22,000 km on the clock. 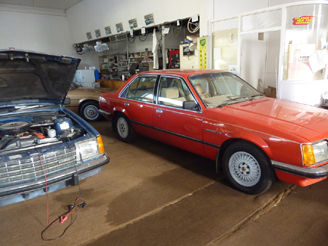 One of the Brock Holden VC Commodore cars, 1980-81, painted a distinctive deep red color. Holden VV Commodore SL/E, 1978-80, painted mailbox red. This may be another Brock vehicle. Sadly the Canowindra Motors Holden Museum is now closed. After unsuccessful attempts had been made to sell the whole of the Museum's irreplaceable collection to an Australian museum or other Australia-based buyer (to keep the collection together as a whole and keep it in Australia), the collection was sold by auction during a three day clearing sale beginning on 30 September 2016. The cars and associated memorabilia were sold to buyers from all over the world. The above page has been kept online as a photographic and historical record of a unique collection of "Australia's own car". All photos on this page: John Wagner.